During the lifetime of previous and current projects, we have been working helping farmers most excluded from the digital revolution to make the most of digital; both personally and for business. We'd like to build on the success of the previous projects focus the same successful mentoring approach but to focus on the upland farming areas of Dartmoor and Exmoor. Farmers across Dartmoor and Exmoor areas will be able to utilise the benefits of faster broadband, for example, using Cloud for storage and backup, video conferencing for telephone calls and keeping in touch, and embracing all forms of social media. Through this project we will be offering 100 hours' worth of mentoring, therefore up to 100 individuals could directly benefit from this project, depending on need. 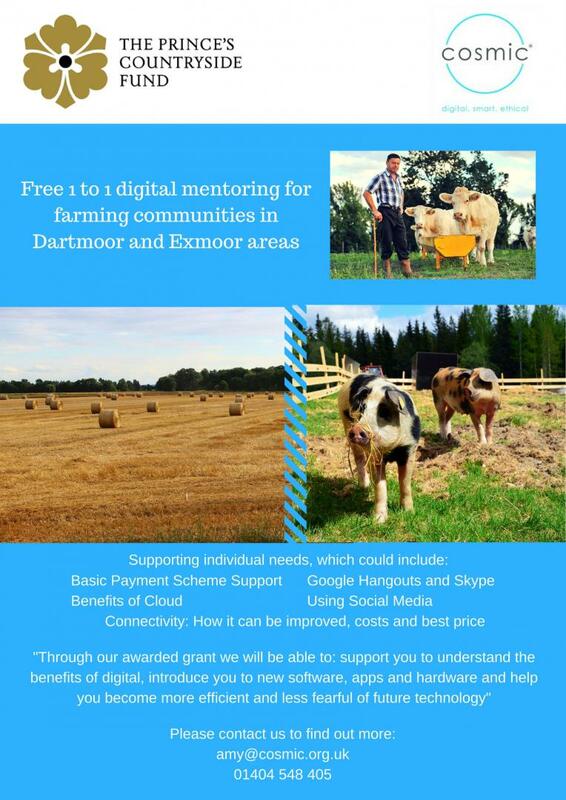 Cosmic IT Trainer Nina Goodwin who is heavily involved in delivery of the project said; “Cosmic are delighted to be providing digital support and mentoring for farmers in our most rural locations of Dartmoor and Exmoor. Through our awarded grant, we will be able to transform farmers lives, enabling them to understand the benefits of digital, introducing them to new software, apps and hardware and helping them to become more efficient and less fearful of future technology". There are a broad range of outcomes that this project will deliver. Most importantly, it will encourage farmers to embrace technology and join the digital age. This confidence in using digital technology will increase and they will continue to develop new skills independently far beyond the time of our intervention. If you’re a farmer in Dartmoor or Exmoor, or you know anyone who might benefit from this, you can organise a one-to-one session by getting in touch with Amy Harris by emailing [email protected] or phoning the office on 01404 548405.